Whilst classic car enthusiasts are polishing up their pride and joys for the next round of the summer concours season, the unloved side of motoring’s past was celebrated recently with pristine examples of long forgotten motors. The fifth annual Hagerty Festival of the Unexceptional saw a record number of visitors turn out to pay homage to cars that once littered Britain’s streets before quickly rusting away to obscurity. It’s thanks to a small but determined band of enthusiasts that a handful of these have been given the love that their creators must have craved at the time. 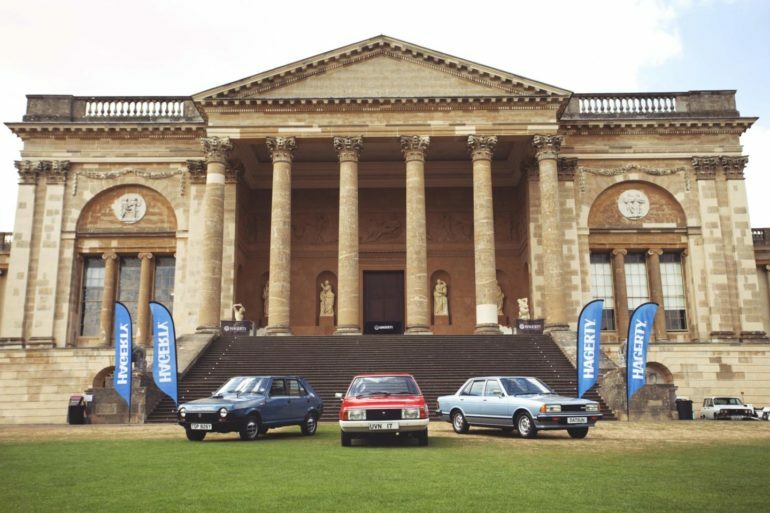 In amongst the period picnics and fashions on the Festival lawn in the grounds of Buckingham’s Stowe House, manufacturer examples of Audis, Mitsubishis, Toyotas and Vauxhalls joined the cherished cars that included past festival winners. Sponsors Hagerty Insurance Agency LLC even produced a fifth anniversary collectors book and playing cards. Most attention was placed on the Concours de l’Ordinaire, however, where the most pristine cars from the 1968-1989 ‘Unexceptional Era’ of mass-produced machinery were up for not-quite-so-prestigious awards. Of the 50 contenders for Best in Show, highlights included a wonderfully original 1979 Citroen GS X3, one of only two road-worthy survivors in the UK, a 1975 Volvo 66 GL saloon – the oldest known example of this ex-DAF model – plus an as-new and very scarce 1971 Fiat 125, an early 1982-built Ford Sierra 1.6L and a very beige 1975 Austin Allegro 1100 with its Quartic steering wheel and hot and sticky PVC brown interior trim. Rarieties included the only Volkswagen 412 4-door saloon in the UK from 2975, plus a 1985 Mazda 929 Estate, a 1982 Peugeot 104 Z ‘Shortcut’ coupe and a wonderfully bland dark blue 1989 Vauxhall Astra Mark 2 Estate that looked almost fresh from a trading estate car park. Once the six-strong panel of judges – including motoring TV personalities Edd China and Jon Bentley – had made their decisions, the winners were announced. The coveted Best in Show was a 1977 Chrysler Alpine, fully restored within hours of the show opening by owner Guy Maylam. It’s one of just 13 of the once-ubiquitous hatchbacks left in the UK. Second overall went to a 1981 Datsun Bluebird GL saloon, whose owner, Kev Curtis and friends dressed up as used-car salesmen for the event. Festival regular Gavin Bushby won the People’s Choice award with a 1982 Fiat Strada 65CL – famously built, not especially well, by robots. Other award winners included Jason Himpson, who impressed the junior judges with his 1979 Vauxhall Cavalier L 2-door saloon and Edward Morley, who braved the heat in an early-1970s blue flared suit and beige shirt and tie, no doubt all made with non-breathable polyester. The final winner was Julie Gandolfi, who won the best period picnic with a base-model 1983 Mercedes-Benz 200T (W123), which has been a family heirloom since new. To prove authenticity, Julie provided a photo of her aged four with the car. Commenting on the Fifth Anniversary Festival of the Unexceptional, Angus Forsyth, Managing Director, Hagerty International Limited, says, “When we at Hagerty first developed the idea of the Festival of the Unexceptional, we wanted to raise the profile of vehicles which are not seen at Pebble Beach, Hampton Court, Goodwood or other such prestigious Concours events. Whilst those events have their very obvious place in our classic car world, we were keen to increase the profile and awareness of the new all-too-forgotten ordinary cars to whom a large majority of people can truly relate; the first car you drove, your parent’s car or simply the car you admired on your neighbour’s drive.